This article explains how a DC Motor works. Basic constructional features of DC motor are also discussed in this article. So This article is about constructional features of a D. C. Motor. Here I will discuss importance of various constructional part of a D. C. Motor like function of stator, function of rotor and importance of commutator and brushes etc. We have already studied D.C. Machines : Basics, Operating Modes & Applications and Types of D. C. Machines but before looking into the constructional features and constructional details of a D. C. Motor it is important to learn how a D. C. Motor works. Thus, here I am discussing some basics and brief description about how a D. C. Motor works. In this type of arrangement a permanent magnet is placed across a conductor winding of copper wire. The winding is called armature winding and this winding is fed from a D.C. Supply system. The end point of the conductors of this winding are connected to a rotating system called commutator. The commutator is a mechanical rectifier and it convert supplied D. C. Power into A. C. and vice versa. The commutator rubs against a set of carbon pieces commonly known as the brushes. The brushes make electrical connection with commutator during its rotation, and the set of brushes are electrically connected to the positive and negative leads of the supply system. This type of arrangement allows electricity to flow through the armature winding. The electrical power flowing through the winding creates a magnetic field that interacts with the magnetic field of the permanent magnet mounted on stationary part of machine called stator and it makes the armature wise spin and finally spins the rotor where armature winding is hosted. 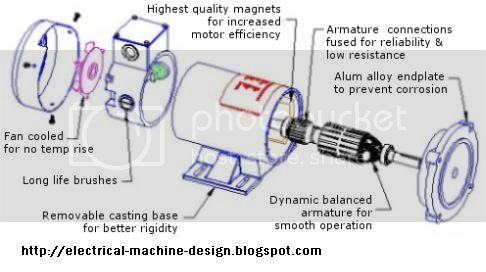 This is the reason why almost all DC motors have armature winding on rotor and stationary windings or permanent magnet for field system on stator. There are some conductors at commutators which are named as commutator bars and there bars are soldered to armature coils to conduct the current to the coil or winding through the brushes. For basics see D.C. Machines : Basics, Operating Modes & Applications. At a given instant the commutator and brush arrangement magnetise a given part of the rotor and thus producing magnetic poles around that particular part. Which rotate that part forward and changing position of the rotor and thus changing position of part magnetised by armature winding and brushes-commutator arrangement. This makes the rotor or D. C. Machine rotates continuously. In both cases stator is essential. i. It provide mechanical support to the machine. ii. It host magnetic field system as magnetic poles of main magnetic field are mounted on stator. iii. Most importantly it provide path to magnetic flux with very small reluctance. As I have already told main field system is of two types. In permanent magnet system, a permanent magnet is mounted on stator and in electromagnet field system an Inductor is mounted on poles on stator and a current is passed through this inductor to produce a magnetic field. This system produce auxiliary field system or second field system. Armature winding is hosted on rotor, the rotating part mounted on a shaft and is placed in stator with small air gap. As I told above function of commutator is to magnetise particular part of the rotor and brushes help commutator to perform this function. The diagram shown below explain proper construction of a D. C. Motor.